A couple weeks ago, I was excited to read an interesting article by Nancy Plumley in the Journal of the Lancaster County Historical Society highlighting letters exchanged between siblings of the Rakestraw family in Bart Township, Lancaster County. The letters give insights into daily life on a farm in 1865, as well as the social network of Quakers in Southern Lancaster County that included some of the most ardent abolitionists and participants in the Underground Railroad. The family of interest is that of William L. Rakestraw (1813-1869) and Sarah S. (Sugar) Rakestraw (1814-1906). Their farm stands just south of where Mt. Pleasant Rd. crosses over the Enola Low Grade Line in Bart Township (two farms away from Middle Octorara Presbyterian Church, where Capt. Samuel Boone was buried after his death at the Battle of Perryville). William's activities with the Underground Railroad earned him a couple mentions in Robert C. Smedley's 1883 History of the Underground Railroad in Chester and the Neighboring Counties of Pennsylvania, and Sarah's family was involved as well. They had four children, including John Sugar Rakestraw, the recipient of the letters in Plumley's article. I also found the article interesting as many of the names mentioned in article are those in a cartes-de-visite album listed on Ebay that I acquired back in 2007. Based on the labeling of "aunts" and "uncles" and conversations with Nancy Plumley, the album likely belonged to William and Sarah's youngest daughter, Abbie (1854-1929). It contains 20 photos--15 identified--mostly of John S. Rakestraw's aunts and uncles and presumably family friends. Tax stamps on the back of many of the photos allow us to date most of the photos to the mid-1860s. Joshua Gilbert. 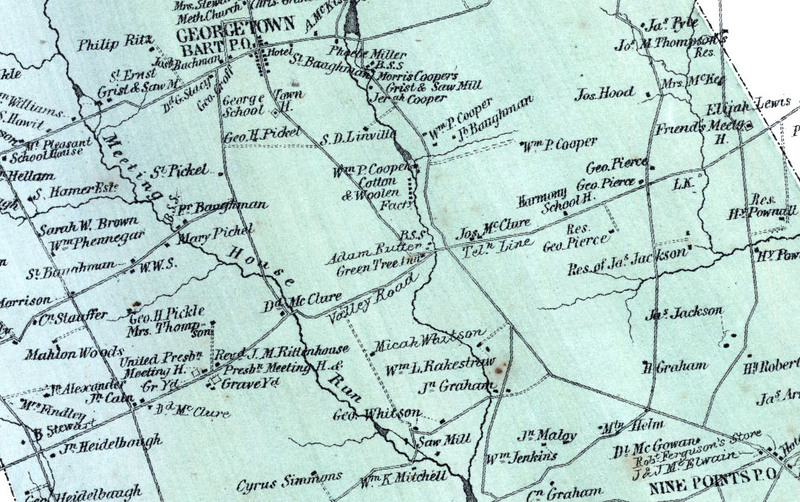 Gilbert (1801-1876) was a pump maker with a farm east of Quarryville. In the 1830s, hee employed fugitive slave William Wallace, before William Wallace went to work for Gilbert's neighbor and brother-in-law, Henry Bushong. At Bushong's farm, Wallace lived in a tenement house with his family. That house was the site of later confrontations with slave catchers and a subsequent jailing that got the Fulton Opera House its underground railroad designation. Thomas and Susan (Barnaby) Rakestraw. Thomas Rakestraw (1811-1886) and Susan Barnaby (1806-1874) married in 1835 at the Bart Friends Meeting in Lancaster County and moved to Ohio soon afterwards. Their second child, William L. Rakestraw, graduated from or was a law student at Mt. Union College, and served as a captain in the 19th Ohio Infantry. He died in camp of diphtheria in 1861 One wonders about the conversations within Quaker families about the war, and how they balanced their abolitionism and pacifism. Even in the 79th Pennsylvania, we have several examples of soldiers from Quaker families enlisting. See, for example, a previous post on another network of Quaker families in Drumore Township near Liberty Square with two soldiers in Company E, 79th PA.